For the first time ever NFL players wore personalized cleats during Week 13 games. And they didn’t get fined! The NFL partnered with The Players’ Tribune to debut "My Cause, My Cleats" campaign. This campaign allows NFL players to wear custom cleats in honor of a charitable cause of their choosing during Week 13 games. Also, the players have the opportunity to share their personal connection with their particular cause through The Players’ Tribune. Over 500 football players worked for 18 months to bring this vision to a reality, according to the NFL. Cleats are an extension to a player’s performance. From the comfort to the atheistic, cleats are the like the chocolate icing on top of a hot chocolate cake that triggers a game-on mentality. Imagine how more dominant a player feels when they’re able to rock a pair of custom-made cleats that symbolizes their passion. 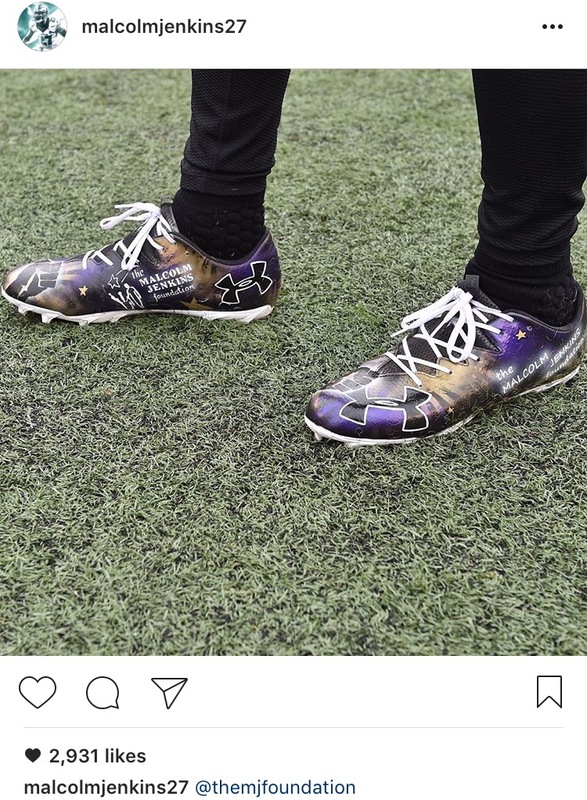 For this campaign, players wore cleats supporting a variety of causes including vision impairment, Flint water crisis, veterans, breast cancer, global education, CMT disease, John Hopkins Alzheimer’s Disease Research Center, pediatric cancer, mental illness, social injustice, and so much more. A league that is known for its extremely rigid uniform policy and is always ready to hand out at least $6,700 and $12,154 fines for first and second offenses respectively, NFL Commissioner Roger Goodell shared support for the players and the campaign. “One of the great NFL traditions is how our players passionately support important causes in their communities and around the globe every year,” said NFL Commissioner Goodell. They are incredibly creative by nature so we are not surprised how they are seizing the opportunity this week with inspiring expressions of their charitable commitments on their cleats, online and through social media,” he continued. In addition to players playing with passion by wearing their cause-related cleats on the field, they are able to raise funds for their cause by auctioning off their cleats online via NFL Auction. All funds will be donated to their respective 501(c) (3) nonprofit organization. BiancaMarley.com selected 22 of the most memorable cleats that were sported on the field based on creativity only. We admire every single cause that each player is committed to and did not want the causes to influence our top picks. This was a fun process as we couldn’t help but research the diversity of causes represented while we handpicked these notable cleats. To see what other players wore during Week 13, use #MyCauseMyCleats on Twitter and check out The Players’ Tribune to read and hear about their connection with the cause. Mission: To better the vision of Denver-area youth by providing them needed eye examinations and eyewear to succeed in the classroom and in life. Mission: To provide local children of all ages with the opportunity to interact with community leaders on a weekly basis to play, eat and, most importantly, get to know each other.